The Stanley Cup Finals has arrived and will pit two of the oldest NHL franchises together, as the Chicago Blackhawks and Boston Bruins will battle it out for the greatest of prizes in professional ice hockey. The Stanley Cup Finals is always a tremendous event and is sure to be hotly contested. These two powerful teams have overcome various odds to reach this point and any hiccups could result in catastrophe as the games are now being played entirely for keeps. But with each side having been victorious in 3 straight playoff series, confidence will surely be high, along with fans’ hopes. So who has enough left in the tank to lift the Stanley Cup in 2013? While the Blackhawks had the best record in the NHL, the Bruins will be fearless after sweeping the Pittsburgh Penguins and denying Sidney Crosby another chance to dance with the cup! The playoffs have been long and trying, with both teams fighting in tough matches and series, and having played several memorable overtime games. Basically, what I’m trying to say is that these teams are very evenly matched, and that the winner of this Stanley Cup Finals will be whichever team simply wants it more and puts in that final pass or shot to win the cup. With the margins of error so slim in ice hockey, it truly is a series that is up for grabs. The Chicago Blackhawks will like their chances. Their season has been exactly as they dreamed up in the off-season. After a strong season, the team has been propelled through the NHL Playoffs with good play from Patrick Kane, Marian Hossa, and Patrick Sharp. Although regular season star Jonathan Toews hasn’t contributed many goals recently, his assists have come at crucial times and he could start hitting the net soon. The Bruins have excelled from the play of David Krejci, who’s taken the team to new heights and helped this improbable playoff run. Another factor that makes the Bruins a legitimate threat to the Blackhawks has been their incredible goalie play by Tuukka Rask, who allowed just two goals against the free-scoring Penguins over four games. After an incredible comeback in game 7 of the first round of the playoffs against the Toronto Maple Leafs, the Bruins have been the best team in ice hockey and like their chances as well. However, Blackhawks goalie Corey Crawford is no pushover and has played sensationally this postseason too. All this sets up for an incredible and hard-fought Stanley Cup Finals. Both teams are recent champions and know what it takes to lift the cup. Both squads have played incredibly well in power play defenses as well. This suggests that games will be low-scoring and hard-hitting affairs. Although such games are not often as exciting as goal-scoring frenzies, this Stanley Cup Finals will surely be a testament to “old school” hockey. For fans of these teams, their nails will be bitten every step of the way. So which team is going to take the Stanley Cup? I still like the Chicago Blackhawks. They have been the better team over the whole season, and while the Boston Bruins are getting hot at the right moment, the Blackhawk’s consistency gives them the edge. Nevertheless, I predict this series will go 7 games, with the Blackhawks enjoying yet another overtime championship clinching goal by Patrick Kane. 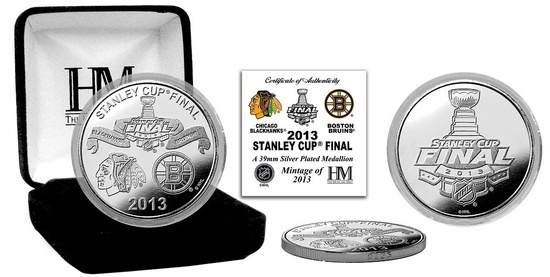 No matter which NHL team you are rooting for, we have your Stanley Cup collectibles. We specialize in authentic autographed sports memorabilia for all professional sports, including the NHL. Check out our NHL autographed memorabilia to determine if we have an autograph of your favorite player. AAA Sports Memorabilia provided a lifetime guarantee on all autographs as they come from the most-trusted companies in the industry and all autographs are obtained through private signings. Visit us today!